We are satisfied with the progress we see you making, and we are encouraged by the receptivity that we feel you have for our transmissions. We do not see any reason why any of you should fear an undesirable set of circumstances for the human collective, but we know that you do at times access and feel those fears. We also want you to recognize yourselves as being the ones who are doing the majority of the work to ensure that humanity stays on the right path. Now, we understand that doubt creeps in as well because you don’t see the overwhelming changes on your world that you hear about. You don’t see the predictions coming to fruition that you want to see coming to fruition, and we recognize how discouraged you can get when even the circumstances of your own lives seem to either be stagnant or changing for the worst. But we assure you that things are getting better on the energetic plane, and it is only a matter of time before you start to see the changes in your personal lives and on the planet as a whole. Now, you also recognize that there are those among you who benefit from keeping you in fear and doubt, and there are those who benefit from keeping you divided. So whenever you get triggered by any of these emotions, you need to continue to do that work that you’ve been doing. You need to continue to do the heavy lifting for the collective, and you need to remain hopeful. 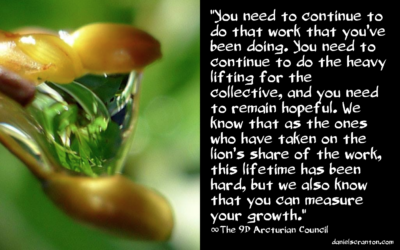 We know that as the ones who have taken on the lion’s share of the work, this lifetime has been hard, but we also know that you can measure your growth. You can see how far you’ve come, and you can expect that trend to continue. You can expect yourselves to continue to rise up and be the wayshowers for the rest of humanity that you were born to be.